Sometimes, a great idea for a business is a lot more exciting to the business owners than to their customers. When hit with customer resistance, the business has to adapt – or die. That happened to Dan Graham, CEO of BuildASign.com. With two friends he’d known since high school, and a fourth partner who had once been a client of theirs, Graham set out to build a web development company. Along the way, they hit upon the idea of designing a web site that let people design their own signs online. But it didn’t work out that way. It turned out that shop owners didn’t want to design their signs online – they believed their customers wanted something they could see and touch. They wanted something tangible. Graham and his partners – friends Ty Barho and Blake Borgeson, and former client J.R. Kraft – knew they had a good idea, and decided to pursue a “ready, fire, aim” strategy. They built their website as a sideline to other development projects in the hopper, and with some basic online advertising, they soon started attracting customers. Their customers were across the country, and they expected three-day delivery of their signs. But Graham and partners had negotiated low prices with an Austin sign shop, and the shop wasn’t going out of its way to service Graham’s customers. Graham, who was finishing law school at the University of Texas at the time, joined the production line at the shop to get the signs out on time. Then he would head for his 100-square foot office to cut checks for the sign shop, to pay for the signs they had just made. 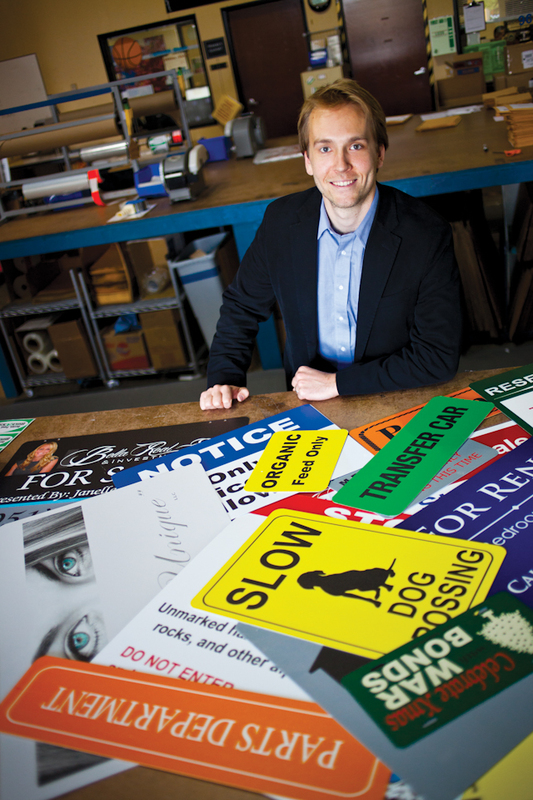 He and his partners had earned $20,000 by outsourcing production to local sign shops – and it was enough to buy a sign printer. They leased 1200 square feet of space, moved in the printer, and started producing signs. BuildASign officially started on January 1, 2006. By the end of that month, the company was turning a profit, and all the partners were getting paid. “We were very surprised by how quickly it grew online, and the market was coming to us and helping us really define what we wanted to sell,” said Graham. They still had to learn about the sign industry, said Graham. “We were definitely very competent in certain areas like general business principles, management, accounting and the correct way to organize and run a company. We were very confident in that respect, and definitely not at all confident in the sign industry category.” But sign printing, types of ink, types of drying and curing times, installation mechanisms – those were all new.